Palestine is a state with only limited recognition. It is based in the west bank territories, between Israel, and Jordan. The flag was undoubtedly inspired by the flag of the Arab Revolt. An uprising against the Ottoman Empire, with the involvement of T.E. Lawrence (Lawrence of Arabia). The flag chosen to represent the movement was a horizontal tricolour of black, green, and white. On the hoist side of the flag, is a red isosceles triangle. 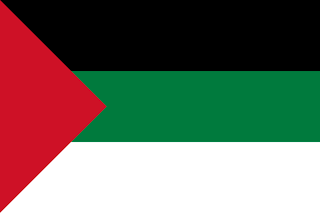 This flag was subsequently adopted to represent the Palestinian movement. 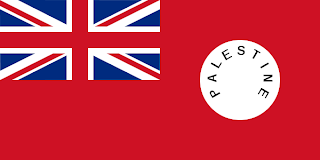 However, post-WWI, Palestine became a British mandate, and a red ensign was used to represent the territory. A red flag, with a Union Jack in the upper hoist. In the fly, a white disc, and within the disc, the name of the territory in black type. In 1938, a new Arab Revolt flag was used, to protest against the settlement of the Jews in the territory in the build-up to the creation of the State of Israel. This new flag took the Arab Revolt flag, with some slight alterations. The white stripe was now placed in the middle, and the green was moved to the bottom. In the triangle, a white crescent and cross. The use of these represented the resentment felt by Muslims and Christians that the land that they also hold as "Holy" was being handed over to the soon-to-be Jewish state of Israel. 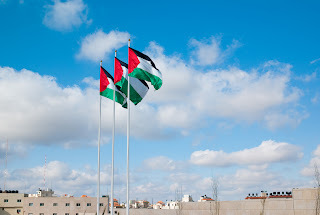 In 1948, the current flag was adopted, and duly recognised as the flag representing "Palestine" by many Arab nations. The red in the flag comes from the Khawarij. The first Islamic group to emerge, and they used a red banner as they expanded their influence throughout the Middle East, and North Africa. The black comes from the Prophet Mohammed, and it was taken by the Abbasid dynasty. White comes from the Umayyad's, who ruled from Jerusalem, and took white to differentiate themselves from the Abbasid's. And the green comes from the Fatimid dynasty of Morocco, who took the colour because of its links to the Prophet Mohammed, and Islam.